1. Why Nulaxy? 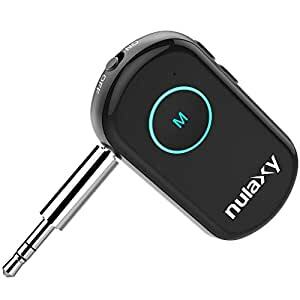 Nulaxy is the most popular brand, and provides the best Bluetooth solution for car wireless audio transmission. Nulaxy is dedicated to produce high quality and reliable products. You can register 18 month manufacture warranty with Nulaxy. 2. Advanced Noise Canceling and High Clarity Sound - CVC technology is used to reduce the loop echo effect. CSR is the highest standard Bluetooth chipset for top level sound quality. 3. 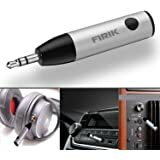 Ultimate Wireless Audio Adapter for Both Car and Home Stereo System - Establish wireless connection with your Bluetooth devices, and stream music to your home or car 3.5mm stereo speaker system. 4. 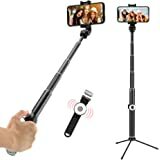 Extended Battery Life and Support Dual Connection - work up to 13 hours as tested; can connect with two Bluetooth devices simultaneously, range up to 50 feet, varied by obstacle conditions. 5. Broad Compatibility (Support iOS Siri) - compatible with most smart-phones, tablets; easy control buttons: volume up/down, pre/next song, play/pause, answer/redial calls. Nulaxy, Drive you safer and better! 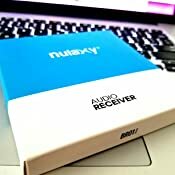 The Nulaxy BR01 Bluetooth Receiver establishes wireless connection with your Bluetooth devices, and stream music to your home or car 3.5mm stereo speaker system. 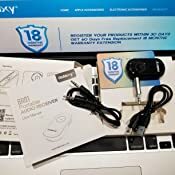 It is compatible with most smart-phones, tablets, headphones, car and home audio system, and provides the best crystal sound with innovative technology developed by Nulaxy engineers. Ever heard of the CVC Noise Cancellation Technology? With this system it brings advanced audio enhancements and noise suppression to the near and far end, and provides packet loss and bit error concealment. In combination, this delivers the best possible call quality on Bluetooth headsets, handsets, hands-free devices and automotive communication. Problem with connection failure because it is far from the desired device? Our battery will not disappoint you. Nulaxy battery has long durability and performance that works up to 13 hours with a single charge. 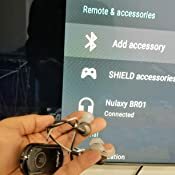 With our device you can connect with two Bluetooth devices simultaneously. BR01 Bluetooth adapter also provides direct access to the SIRI function for all your iPhones or other iOS devices. Grandeur Whiskey Glasses Luxury Gift Box Set of 4. Lead Free Double Old Fashioned Crystal. 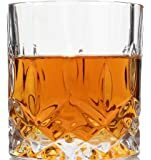 Perfect Gift of Whisky Tumblers Glass as a Birthday present, Fathers and Mothers day, Christmas present. Money back satisfaction guarantee. Arrived in a neat little package. The receiver is pretty small in size which makes it easy to carry around. I have been using it over the past week or so and it does it's job pretty well. My use case was pretty simple. Pair it up with my mac to able take the calls from home without having to sit next to it. Second, pair it up with my android tv box to be able to watch my shows without waking up my kid in the evening. Pairing it up was quick and easy. 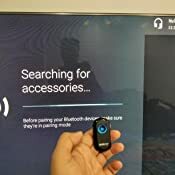 I could not try out the max distance but that as long as I was in sight of the bluetooth source (my mac or the android tv box) it worked perfectly. As I moved into other rooms, it started breaking up. The volume buttons on the side is pretty handy as well. There is a built in mic which i did not use. Once you plug in any existing earphones (eg. the one that came with your phone), the inline mic takes over and the sound quality is pretty good for the listener. Overall a good buy for the price. I bought this variation of the wireless bluetooth receiver due to its small size and the easy to use pairing method. This was tested on my JVC boombox which is a slightly an older model and only consists of 3.5mm headphone out. The bluetooth wireless dongle came charged so I did not need to charge it, I connected it to the 3.5mm socket on the JVC and paired it with my iPhone, it was seamless and compilation free. The sound quality is clear however there is distortion at the high end when the volume is turned up however this may be with all devices. The range is significant although it says 50m I have not tested this yet. 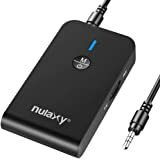 Works alright, range is pretty bad and probably below the listed spec, occasionally managing to cut out from across my room when I leave my phone on my desk controlling my sound system through this adapter (I have aux cords with longer range than this). The fact that it needs to charge and can't just draw power from the aux is annoying and made me think it had broken when it went dead. To its credit the battery lasted longer than advertised, but it achieves this with an aggressive sleep mode that comes on even when the device is plugged into charge, and only wakes up with a full reboot so if you're hoping to have this plugged into power and aux at all times and have a always ready to go system, you won't get it with this device. Seems like a real dumb omission of a feature they could have easily given users control over in software. Super expensive for frankly quite limited functionality, but it does the job, but I can't help but be slightly annoyed my car now has 2 cables and heaps of bluetack just to manage this thing. Good Value of money. Good solid build. Not like that cheap plastic. Even the packaging is pretty decent. 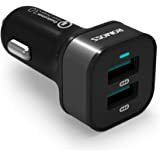 Expect a slight static noise when charging cable is plugged in when using in the car. Only noticeable when nothing is playing on. Once paired the first time - It connects automatically to the phone every time afterwards. It turns off automatically after a few mins when you turn the vehicle off, however you have to flip the switch off/on to turn it back on next time you drive. Preferably turn it off when you leave car and flip it on when you return. A bit tedious to connect two phones at a time however it works. The customer services is exceptional - like really good. If you have slightest of issues - Straight up replacement or return offered. No questions asked. Product is well built and functions well. Sound quality is excellent. Love the product overall. Bluetooth connects really fast with the phone. Although i do have some preference issues with it. 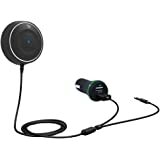 Most bluetooth receivers are intended for use in cars. This one is modular that the 3.5mm jack can be swapped from the conventional type that sticks out of the device to a cable. 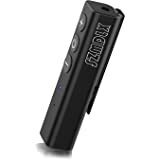 Works well with the bluetooth on my phone as well as a wired speaker at home that this can plug into and make it a decent bluetooth module for my speakers that I don't need to leave my phone around the speakers. Not sure how far 60 feet is but it is as you'd expect from a conventional bluetooth speaker signal strength. 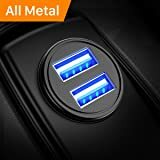 5.0 out of 5 starsMust have if you have an old car with an aux input. This is little device has changed my life. I have a pretty old car and this thing has made it so easy to listen to my music and stop listening the crappy radio and adverts. Plus I can listen all the podcasts I want. Works perfectly and battery seems to last a long time as well. Works great for my old car stereo with no BT support. 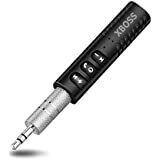 It came with 2 cables, 1 long AUX cord and 1 metal short AUX cord, I used the short one so it sits better in the car, easy to use, didn't read instructions and it's all working well.